Beautify CNMI! : Have You Seen Cookie? Please help find Cookie. Cookie belongs to Mrs. Aya Matsumoto. Aya-san leads ISA-CNMI, which is a very active partner of Beautify CNMI! Aya, an active Beautify CNMI! volunteer, has lost her dog, Cookie. Time is of the essence in getting Cookie back to Aya safely, so we are asking for your help. 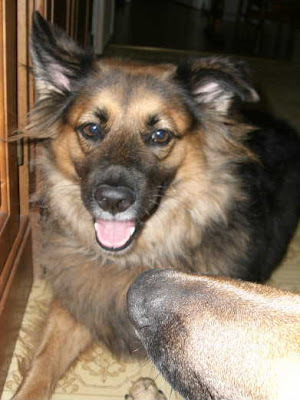 Cookie was last seen at 1:00 a.m. on April 6, 2007 in Gualo Rai, Pacific Eagle Bldg. She is wearing a red collar. If you have any information, pleaes call Aya at 234-1210. Aya will be leaving the island on Sunday, so if you see Cookie after Sunday, please call Katie at 256-0243 or email me at busenkell@gmail.com. and cant believe that your gone. Editor's Note: If I'm not mistaken, Marie is Aya-san's daughter who lives and studies in Japan. Thank you Katie and everyone who can help us find Cookie.